The only performer to earn 5 stars on the Hollywood Walk of Fame—for film, recordings, TV, radio, and live performance—Gene Autry was the singing cowboy king of American entertainment. Now, in Public Cowboy No.1, Holly George-Warren offers the first serious biography of this singular individual, in a fascinating narrative that traces Autry's climb from small-town farm boy to multimillionaire. Here for the first time Autry the legend becomes a flesh-and-blood man—with all the passions, triumphs, and tragedies of a flawed icon. George-Warren recounts stories never before told, including revelations about Autry's impoverished boyhood, his adventures as an up-and-coming singer, and the impact his unbelievable success had on his personal life. She describes Autry's loving but doomed mother, who died on the brink of her son's success, and his ne'er-do-well father, who married five times and wandered the west. Autry battled his own demons but emerges here in a positive light, an immensely personable man, one of America's most charitable benefactors, known for his boundless generosity, and a patriot who enlisted during World War II. The book provides equally colorful details of Autry's lengthy radio and recording career, which included such classics as "Back in the Saddle Again" and "Rudolph the Red-Nosed Reindeer"; his movie career, where he breathed new life into the Western genre; and his role in early television, being the first movie star to develop his own TV shows. And along the way, we see how he invested shrewdly in radio, real-estate, and television, becoming the owner of the California Angels and the only entertainer listed among 1990's Fortune 400. 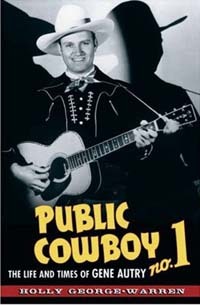 Based on exclusive access to Gene Autry's personal papers, as well as interviews with more than 100 relatives, employees, colleagues, and friends, this engaging biography brings to life a major Hollywood star—a man who, more than anyone else, put Western music and style on the American cultural map. About the Author Holly George-Warren is an award-winning writer, editor, and frequent commentator on Western films, music, and fashion. A contributor to more than 40 books on popular music, she is the author of Cowboy! How Hollywood Invented the Wild West and coauthor of How the West Was Worn: A History of Western Wear. She is also author of the children's books Honky-Tonk Heroes and Hillbilly Angels: The Pioneers of Country & Western Music and Shake, Rattle & Roll: The Founders of Rock & Roll . Her writing has appeared in The New York Times, Rolling Stone, Village Voice, Entertainment Weekly, and many other publications. Beginning in Fall 2006, she will be Adjunct Professor of Journalism at SUNY-New Paltz. She lives in the Catskill Mountains with her husband and son.